A broken washing machine can be a nightmare. Not only are you unable to put on that big pile of laundry but a broken machine can cause a mess as well. Leaking water or obnoxiously loud noises can be a real pain with an appliance that is used on a daily basis. Finding a washing machine repair service that covers all makes and brands can be difficult. Luckily we are here to help. Many services repair washing machines however they don’t cover all the brands we are qualified to work with. The brands we repair cover all models including many lesser known manufacturers and those that aren’t on sale anymore. If your washer is broken, then you have come to the right place. Unlike other domestic appliance services, we cover all appliance brands. This includes AEG, Bosch and Beko, Hoover and Hotpoint, LG and Samsung, Indesit and Zanussi. In fact have a look at the full list of the brands we repair to get a better idea of how extensive our knowledge and experience is of washing machine brands. We can fix any washer no matter the make or model. We also guarantee the work that we do and every repair comes with a 12-month warranty provided as standard. It isn’t just the makes we service that makes our business so popular. We also have a huge range of replacement parts to fit every appliance. Our engineers use both old and new parts that are of the upmost quality to get your appliance working again. With over 5000 parts and components in our stock room we can find the right part to use for all appliance brands. This includes bearings, replacement carbon brushes, belts, drum paddles and even spare hinges and pumps. Our huge selection of replacement parts come with a 12 month guarantee too and we can locate and install the required component in rapid time. With over 25 years of experience we know how to deliver a local service that is not only efficient and friendly but also keeps prices at a reasonable level. Our engineers are fully qualified with second to none in-house training and at least 10 years of experience. 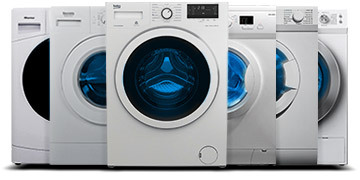 You know that you are getting quality and efficiency to repair all washing machine brands with our professional service. We cover the Greater London area within M25 so why not schedule a repair with us today? It is really easy to book your repair with us. In fact you can even do this via our online booking form and choose a slot that fits around your lifestyle. We aim to have your washing machine operational as soon as possible and remove the stress of having laundry pile up day after day. If your washing machine is broken, then the brands we repair and our expert service coupled with our years of experience will have it back up and running in no time.